Ok, this is the area of the website where I am going to explain to you who the masterminds are behind The Buoy. We are the three amigos, also known as the The Buoy Boys. Here are a few of our passions: camping, snowboarding, skiing, wake boarding, wake surfing, adventures, sky diving, dancing, biking, 5:00am surf sets, traveling, snorkeling, vitamin d, ice-cream, spring break 09, and last but not least FOOOOOOD! These passions have lead us to where we are today. Most of all though, we love hanging out with people and having a good time. Life is about friends, family, relationships, and of course AWESOME FOOD. With all these things in the back of our mind, we thought what better way to connect with more people on the lakes than starting a floating restaurant with great food! We look forward to meeting all of you and hearing all of your stories and adventures. 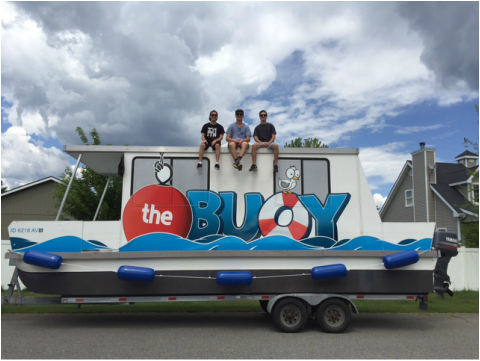 Make sure you stop by The Buoy this summer for some amazing food, drinks, good times, and some laughs. It's a great question, really. Let me explain that to you. We are a few salty sailers that love kicking it out on the lakes in the summer and enjoy having a good time with awesome people. For the most part, we are pretty laid back human beings. As a group we have always looked at things a little differently and by having this mentality of thinking outside the box, we decided to take action on starting a floating restaurant on Coeur d'Alene Lake. Hopefully you like the idea of having this service out on your lake. The three owners are Corey & Gared Schneider and Essex Prescott. We have been in business together as a tripod for the last 10 years. Rewind 10 years back and we land on the year 2006. The summer of 2006 is the year business began for us. This is when we put all of our brains together and came up with the idea to teach wakeboard and wake surf lessons to tourists on CDA Lake. After a few months of planning, at the young ages of 14, 15, & 17 we started this venture (which we continue to run to this day) called Hayden Wake. People often have referred to us as the Hayden Wake Boys, however, a lot of people call us the 3 amigos these days. Whether you see us creating great tasting food in our floating food truck or you spot us out on a wakeboard boat, make sure you wave us down to say hi. We look forward to seeing all of you out on Coeur d'Alene Lake.